I'm a crunchy momma. We eat all organic, no sugar, cloth diaper, use unpaper towels...my son has never (to my understanding) had anything with artificial food coloring in it. He's never eaten fast food. I don't even eat fast food. I'm so far down the biomedical wormhole of healing your body with whole, real food I don't think I could climb out if I tried. And I won't, because I cured my own chronic pain using food. I used garlic drops in my son's ears for his ear infection instead of antibiotics and we babywear year round. 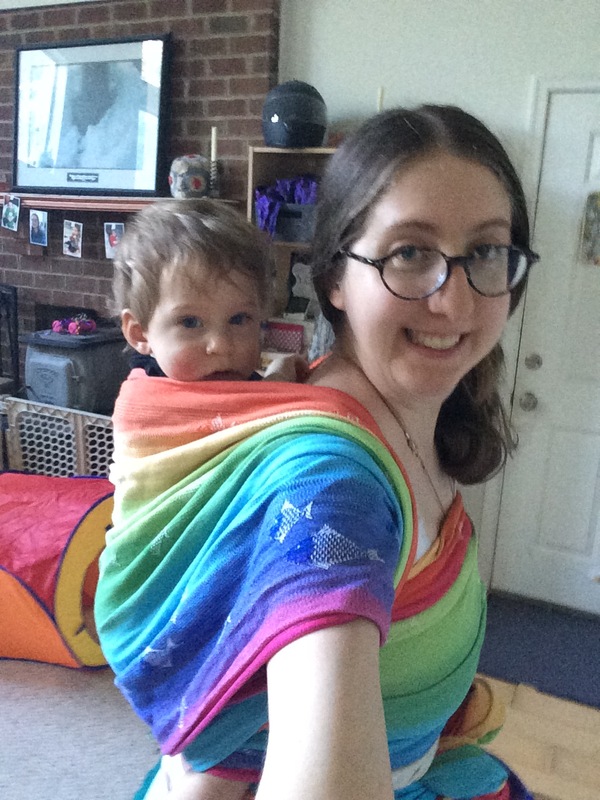 We are still breastfeeding at 16 months with no end in sight, and I am perfectly comfortable with him breastfeeding for as long as he desires. Even if he's five. I love being a crunchy mom. I love raising my son how I think he should be raised. Is crunchy, natural parenting "better" parenting, as many people would have you think? Are granola mom's really stuck up, elitist moms? I can tell you how and why I became a crunchy mom. I read food labels, and I decided I didn't want anything artificial in my growing child who already has serious allergies. When ever I say this, many moms feel judged. "I read food labels too," they say, holding their kid who just devoured whole little Debbie cake in their arms, "and I can't afford that kind of lifestyle." I think that may be the difference between me and the other moms I meet. I would give up almost every luxury to keep providing my child with whole, non-processed foods. It is a priority to me. That is why I do it, because it is extremely important to me. Not because I want to enthrone myself like some organic pariah on a waterfall of gluten free, sustainability harvested breakfast muffins. It's because I care about my child, and I see this as concrete way of caring about him. And that's when I always loose my audience. Because don't all moms care about their children? Does feeding my kid whole foods mean I care more? I read those ingredient lists, I see what a diet full of sugar does to society, and I say "not my child, I will give him the most nutritious food I can. This is important for his future and his body." And I set aside a lot of time to cook from scratch and to research food, and how it works within the body, and how it is harvested and cultivated. I want to know what is in my food. Sometimes I wonder if other moms just don't care. Sometimes I wonder why they let their kid watch 2 hours of television or more a day, and eat cake, ice-cream, deli meat, pasta, and other refined and heavily sugared foods. I HONESTLY don't get it, and I am being 100% transparent. Why do you guys do this? There is a delicate line. I don't know where it is, but I probably crossed it in the above paragraph. I won't mince words, I want to address the elephant in the room, I want to tell you honestly what I think and the questions I have. I know, I am not a better mom. I am a mom just like everyone else. I am only more informed because I made a choice to study and learn. Because I am a mom. My difference is information, information I am able to shift through in a relatively stress free environment. Information, and time. I am a stay at home mom, able to devote a lot of time into finding and cooking good food for my kid. I don't have a stressful job, I don't have to rush through cooking dinner. I made a choice with the information I had: and that choice was to say NO to artificial food after reading published studies from medical and nutritional journals, doing a lot of independent research and learning about the human body. I know my own choices, my own reasoning, but each mom has their own unique journey and that is why we bicker so much and think everyone else is trying to water their garden out of competition and not, you know, because water makes plants live. I'm trying to 'water' my son with whole foods not because I'm "such an awesome mom, omg" but because I really believe it's what has made humans thrive for hundreds of years, and the "food" of today's generation is doing harm to our bodies. And I can't live in silence anymore. I also know many of us moms have been lied to. We are told our kids issues like eczema, pain, constipation, hyperactivity and other neurological disorders have nothing to do with food or environment, that they are all genetically based and there is nothing we can do except start trying different pharmaceuticals. I was stunned when I finally realized MY BODY IS WHAT I PUT INTO IT. Sure, I have genes, and those do play a part. But my son's body, my body--we are what we put in it and on it. It becomes our fuel, it becomes us. And food does impact us. It does. To say otherwise is illogical. This is my foundation, the bedrock on which I put my nutritional choices. Other moms don't have this foundation, and that is why they make other choices. How do we encourage real food in a world where food is a corporate enterprise? 50 years ago most houses would have gardens, 100 years ago most went to "farmers markets" every few days to stock up and every home would have a garden. Part of the problem is this disconnect we have with our food. The most common push-back to organics food I see is the expense. If it wasn't so expensive, would it be your first choice? Food prices are controlled by big corporations who ship from all around the world. Food used to be grown locally, not put on trucks and toted everywhere. We are trapped. It's a trap. We don't know how to grow our own food anymore and it's expensive. Can you see the trap? It's a journey. I suffered from chronic constipation for 12 years, and not one doctor ever mentioned that I could try a paleo diet, or restrict gluten, or try to go dairy free--all things I explored when I finally got fed up (because none of their drugs or recommendations worked) in a last ditch effort to try and heal myself. Six months into the paleo diet and my inflammation, pain and constipation are gone. After 12 years. My journey has made me a believer. Sometimes I think mainstream moms simply are privileged. They don't have sick kids, and they've never dealt with autoimmune issues. I should envy them, but I can't get over what they eat. But mainstream moms also think I am privileged, with free time to devote to cooking and researching and a husband who makes good money to allow us to buy whole, organic foods. Maybe we both are privileged. Listen guys, I'm trying to be honest here. The truth is, and most of us crunchy mothers will tell you if you ask hard enough that we do think we are making better choices for our kids and our families. And that's okay. It does not mean you can't make the choices you want. It doesn't mean we think you are evil for feeding your kid a happy meal for the third time this week. 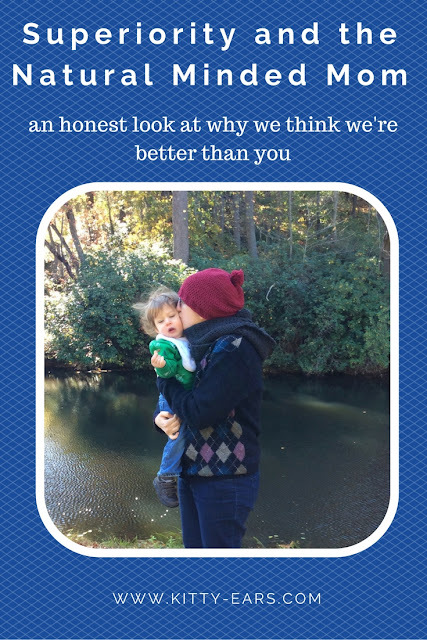 It does not mean we think we are better mothers. It just means we are trying to inform ourselves what is in our food because we care about our bodies, the environment, and our children so much that we critically analyze everything. And I'll support your right to choose what your kid eats until the day I die, even if I wouldn't eat what some consider food these days. I'll leave on this note: what do we do about the supposed superiority of the natural minded mom? Listen to her. And don't take it as criticism on your own choices. Take it as her exercising her right to choose for her family, and celebrate her. And: how do we talk about what passes for food these days and extol the benefits of a whole food diet free of added sugar and refinement without vilifying those who eat that way? How do I say "we eat all organic" and "it's because refined food is bad for your body" and not sounds like a pompous prick?